• German Shepherd breeders are listed below alphabetically by State / city. 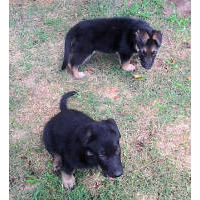 • Click on underlined words to see German Shepherd puppies for sale. • Please tell the German Shepherd breeders with puppies for sale that you found them on BreedersClub.net. One of the most popular dog breeds in the world is the German Shepherd. They make wonderful family pets, excellent guard dogs, and herders. Their strength, trainability and obedience qualify them as the breed of choice for police and military work. German Shepherd dogs come in a variety of colors. Highly rated AKC/CKC breeder of top quality Boston Terrier, Chihuahua and German Shepherds for over 15 years. We have been raising puppies since 2000. We live on an acreage where the dogs and puppies have plenty of room to run and play. Vaccinations and wormings are kept up to date on all of our adult dogs and puppies. All of our puppies are AKC Registered and sold with full registration. We have many references of previous puppy owners that will relay how happy they are with their puppies and the good experience they had purchasing their puppy from us. Shipping is available upon request. One year health guarantee on genetic disorders. I'm Marilyn White, I live in the Ozarks of Missouri with my husband and my dogs. I started my kennel in 2004. I'm a Missouri State licensed breeder. My kennel meets or exceeds state specs. I'm inspected by the MO Dept of Agriculture twice a year that are unscheduled inspections. My kennels are cleaned everyday by myself and my adult daughters that work in my kennel. My husband and I have been married for over forty years and we have always loved all kinds of animals. I love being a breeder and I work very closely with my vet. My dogs have always been a big part of my life and always will be. SHERMAN-RANCH German Shepherd Breeders. AKC OFA Quality German lines. Vigorous Robust German bloodlines. Puppies, started pups and Stud service. Family reared and livestock savvy. www.SHERMAN-RANCH.us . We carefully select the highest quality German bloodlines to ensure the most excellent temperament, intelligence, structure and trainability to the German standard, and raise our puppies to be trusted and loyal family companions. All puppies are bred for strong nerves even temperaments and excellent Health. Our litters have top VA and Schutzhund 3 Working bloodlines together. All of the pups are family raised in the house. Puppies are available to Working Show Police Military and Family Pet Homes. No Kennels. All of our puppies come with a Written Hip and Health Guarantee. Our puppies are sold with Full AKC registration. AKC registered. Breeding since 1967 German Import Stock - Beauty, sound structure, and temperament have always been our goal. Hi my name is Roger, My kennel name, RODAK, has been registered with AKC since1966. Training has been my passion. I have trained 137 registered breeds and 8000 dogs. Your dog is off leash in the first lesson while you watch. Recently, Ruth brought her St. Bernard for training. She said, "this is the tenth Saint you have trained for me. The first one was 30 years ago. It"s great". This breed directory page features German Shepherd breeders with puppies and/or adult dogs for sale. Once you purchase your new found friend, you will want to provide it the best in pet health care. Be sure to visit our online discount pet supplies catalog and order NuVet Plus™ to keep your puppy and adult dogs in top condition. The discount catalog also features collars, leashes, carriers, general pet care products and much more. BreedersClub.net does not pre-screen the German Shepherd breeders who advertise their puppies and dogs for sale in the BreedersClub.net breeder directory and in the classified ads. We require all advertisers to agree to our advertising terms. You should ask the German Shepherd breeders you talk with for references from past buyers and veterinarians.